Why Hire Attorney Brad Swearingen? When people begin the divorce process, they are uncertain about the process and possible outcomes of their divorce. They have heard "stories" of how divorces come out from friends or family, which may be only part of the story. It is my goal to educate you from the first appointment on how the courts decide the critical issues in your divorce, whether it is regarding allocation of parental responsibilities (child custody), parenting time (visitation), maintenance, child support, or property division. By understanding the process of the divorce and what is important to the court, a client will have realistic expectations of what he or she should expect and can be more prepared for each step in the process. Therefore, he or she will be less anxious and more helpful to me and my staff as we work together from start to finish. My assistant has been with me for close to twenty years, and we work together with you, the client, to form a team that each performs specific tasks to achieve the goals the client sets as priorities from the beginning. My experience as a trial lawyer, court-appointed GAL (guardian-ad-litem) and court-appointed mediator, along with my professionalism, will be an asset in the resolution of your divorce. I treat both my clients and opposing counsel with the respect I expect to be treated with. It is my strong opinion that a professional advocate reduces emotional and financial costs for you, the client, and for the other party. One always needs to remember that in a large percentage of divorces, the end of the marriage is not the end of the relationship. There are often children in common which you will always have in common. Litigating a divorce case means it will be more expensive, but sometimes it is unavoidable, as someone has a different perception of what the facts are or unrealistic expectations. When this occurs, my 38 years of courtroom experience will be an asset to passionately defend my client's position, supported by my knowledge of the law and its application to the case. 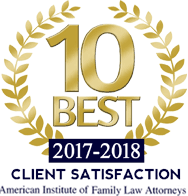 I am very proud of the relations I have created in 38 years of practice with my staff, my clients, my adversaries, the court, and outside experts, including financial and mental health professionals on parenting issues. My office staff and I offer a calm and welcoming atmosphere, so that you the client can feel comfortable and become part of the team created to navigate through this troubling time. We welcome the opportunity to assist you with your family law issue.